Dear Zoo is twenty-five years old -- and still as popular as ever! And with an updated look, this classic children's storybook about a youngster loooking for a perfect pet is sure to delight a new generation of readers! My daughter has loved this book from the very beginning. She was fascinated by the animals revealed when I lifted the flaps, and then had a great time learning how to lift the flaps herself as she grew older. She’s a year old now and brings it to me to read to her more than any other book that we have. She gets a kick out of the animal sounds we make when we lift the flaps, too. It’s the only lift-the-flap book we have that she hasn’t managed to tear off any flaps. I think this book has been instrumental in showing her how much fun books can be – I highly recommend it. This is a great early book. The zoo sends various animals as a pet but they are all unsuitable for some reason (the giraffe is too tall, the monkey is too naughty etc). Finally they send the perfect present: a puppy! The language is simple (in fact, this book was recommended to me by a speech pathologist) and the humor is perfect for the 2-4 age group. My son loves lifting up the flaps and making noises for all the different animals hidden below. 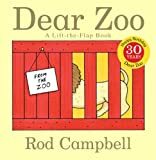 The flaps are also cleverly illustrated so that enough of the animal is visible to allow the child to guess which one is being sent. I must have read it to my son more than 100 times but neither of us are tired of it yet!